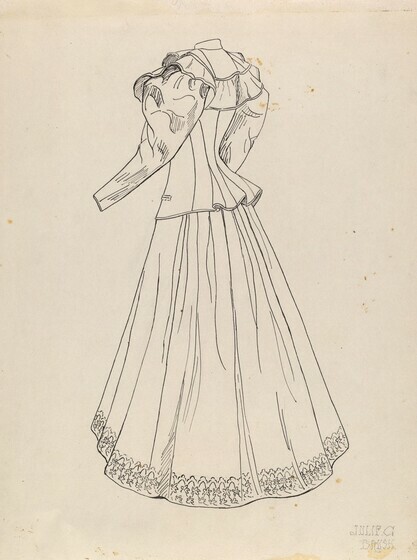 This program provides a brief survey of American fashions from 1740 to 1895. Most of the costumes represented are formal or "fine" garments of the kind that were preserved and handed down in families from one generation to the next. As fashion is influenced by social and political circumstances and by changes in technology, these costumes provide some insight into the character and quality of American life from colonial times into the period of the industrial revolution. In the eighteenth century, elegant dresses were created with elaborately patterned fabrics, lace trim, and ruffles. Costume accessories and hair styles were equally elaborate, modeled on the fashions of women in the French court. French fashion exerted strong influence on English fashions, which were enthusiastically adopted by colonial gentlewomen. 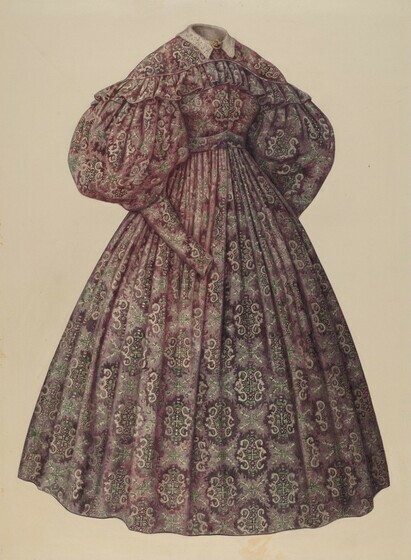 This dress is made from a silk fabric known as "spitalfields," from an area in London where designers and weavers produced silks in a great variety of handsome patterns. Spitalfields fabrics can be dated quite precisely because of surviving records of the weaving designs. This dress can be dated around 1740, since the fabric was most likely woven in that year. Most formal eighteenth-century dresses were open in front, showing a petticoat worn beneath. The petticoat was constructed separately from the dress but was not considered an undergarment. 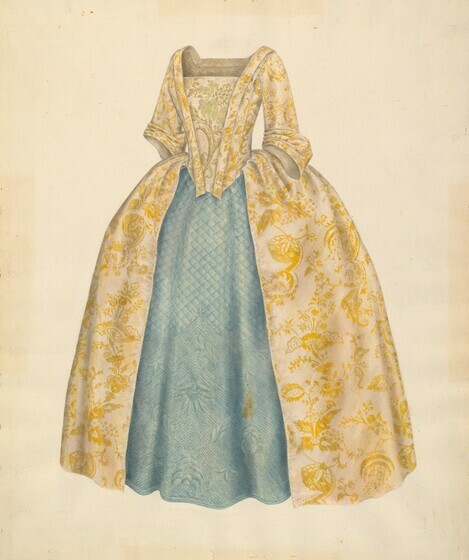 A quilted satin petticoat is shown in this 1740 costume. Oval-shaped hoops, called paniers, support this skirt. The word comes from the French, meaning "basket" or "hamper," since they resembled the baskets for provisions carried in pairs by horses or mules. Paniers were usually made of metal or whalebone. They were also known as paniers à coudes, the French word for elbow, because the wearer could rest her elbows on them. These brocaded silk shoes exemplify the beautiful and elaborate accessories that were part of the fashionable eighteenth-century wardrobe. Since they were not suitable for walking out-of-doors, clogs or pattens -- separate wooden or leather soles -- were strapped on over the shoes when necessary. Men's shoes surviving from the eighteenth century are extremely rare. 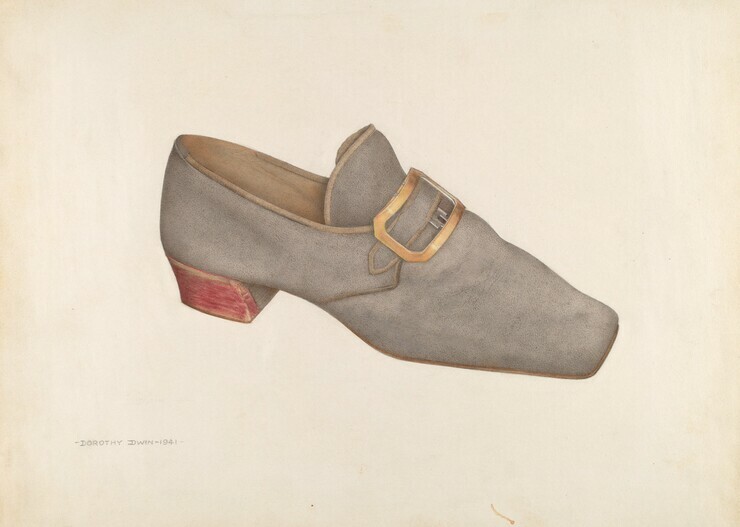 This man's shoe, dated about 1775, is made of gray suede and has a one-inch red leather heel and a brass buckle. 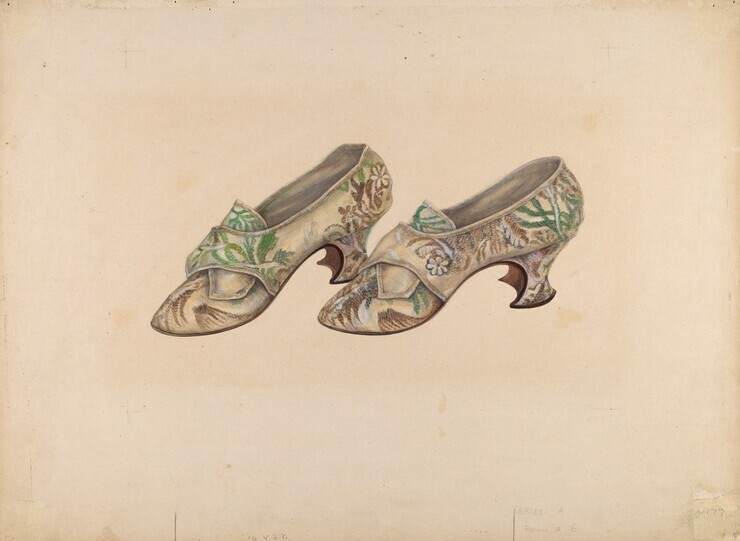 The low, broad heel first appeared in America in the 1770s and continued in fashion until the turn of the century. Shoe buckles were both functional and decorative. Usually, no distinction was made between the left and right shoe; each shoe of a pair could be worn on either the left or the right foot. A man's suit in the eighteenth century consisted of a coat, waistcoat, and breeches. 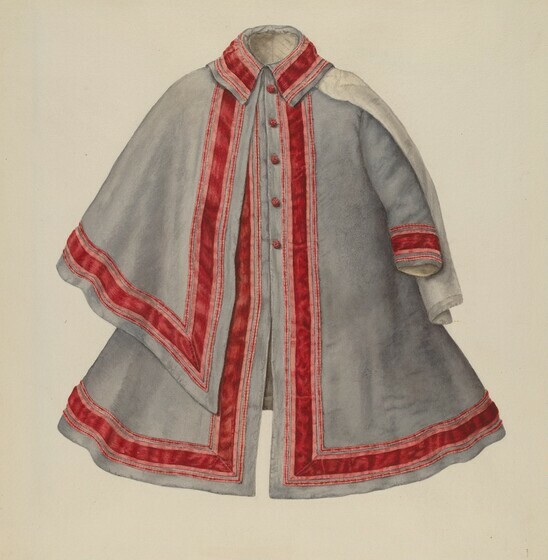 The coat and breeches were often made of matching material. 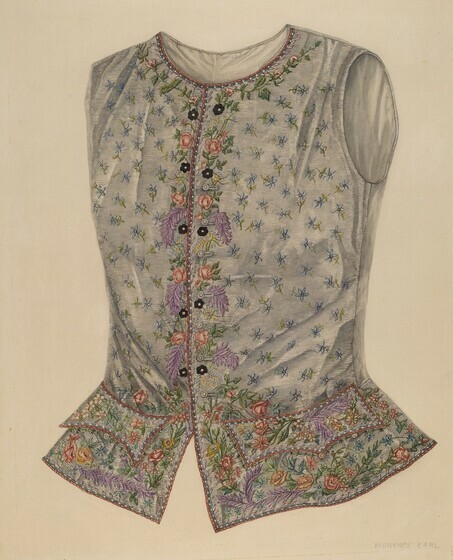 The waistcoat was frequently the most decorative part of the costume. This gentlemen's waistcoat from the early part of the eighteenth century is made of white linen with intricate embroidery called "whitework." This highly specialized form of embroidery, which incorporated a great variety of stitches, was widely used at the time. The eyelets on the left side of the opening in front were most likely for removable buttons or studs. By the middle of the eighteenth century, men's waistcoats were becoming shorter and more open at the center front. 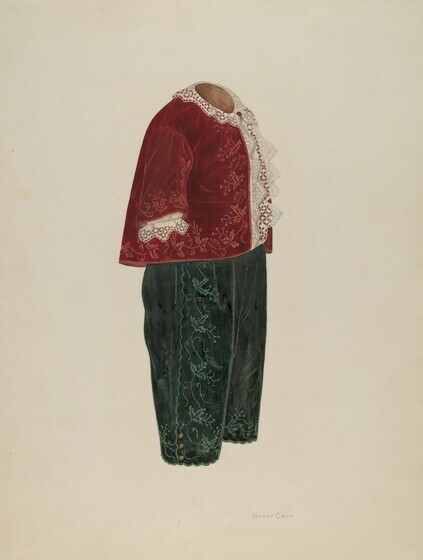 This one, dated from about 1775 to 1780, is an example of the shorter-style garment. 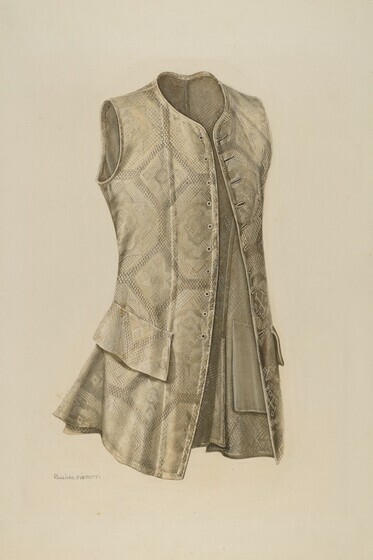 By 1790, waistcoats would be shortened to waist length, and the skirt or "peplum," seen here, would disappear. The scale and type of decoration also changed, becoming smaller and more delicate. 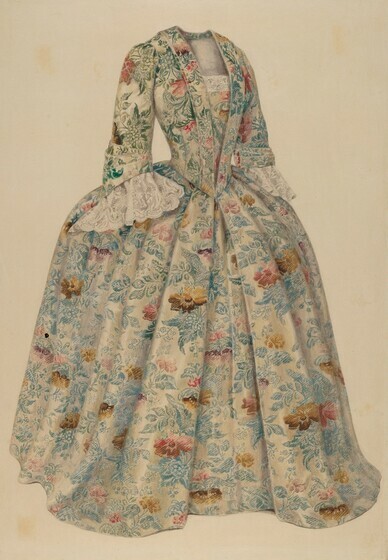 Floral patterns and narrow stripes were also common in the fabrics for women's clothing during the 1770s. A dramatic change in fashion away from extravagance and formality began to emerge in women's clothes during the last decades of the eighteenth century. Influenced by a resurgent interest in classical culture, owing to the archeological excavations of Pompii and Herculaneum earlier in the century, a neoclassical style of clothing came into vogue. More loosely structured dresses made from lightweight fabrics appeared in the 1770s and remained popular throughout the first two decades of the nineteenth century. Frequently these dresses featured a high-waisted bodice that was gathered and adjusted by means of a drawstring. The example shown here, dated about 1822, consists of a satin underdress and an embroidered gauze or net overdress. The effect of the loosely structured neoclassical style depended upon a foundation garment that pushed the bosom upward. 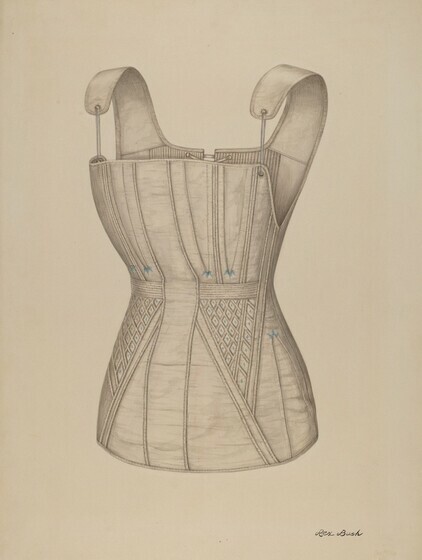 The corset pictured here is made of heavy cotton sateen. The use of straps indicates it was made in the early part of the nineteenth century, about 1815, since straps were no longer used on corsets after the 1840s. The development of industrialization during the nineteenth century led to an abundance of manufactured goods, including textiles, and contributed to reducing the overall cost of clothing. As a result, great variety in fashions was feasible. A well-to-do woman could have a selection of dresses for different social occasions. 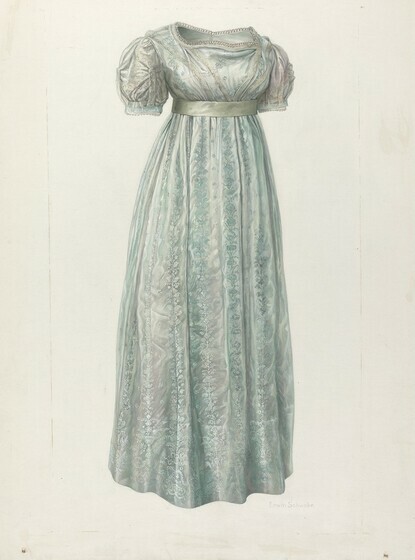 This is an example of a "visiting dress," dated about 1823. The bodice is neoclassical in style. The sleeves, known as the "leg o' mutton" type, gained popularity, reaching a balloon-like fullness in the 1830s. Multicolored printed cotton or linen fabrics were fashionable in Europe as early as the seventeenth century, when trade with the East began to flourish. Later, English and French textile manufacturers began to produce their own versions to compete with imported materials. By the beginning of the nineteenth century, American textile manufacturers were producing inexpensive printed fabrics because of the availability of cheap cotton and the introduction of mechanical spinning machines. 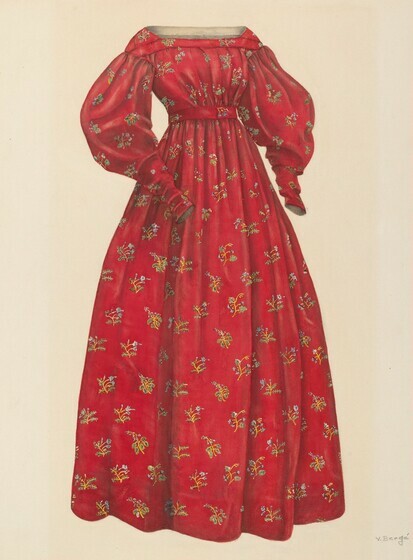 This "house dress," from about 1835 or 1836, is made of a printed cotton fabric. The sleeves, between the forearm and shoulder, required a special down-filled padding to support their large balloon shape. The skirt was extended outward by layers of petticoats. The production of combs began in America in 1759. By 1773, in addition to their functional use, combs of ivory and tortoiseshell were in demand as hair ornaments. 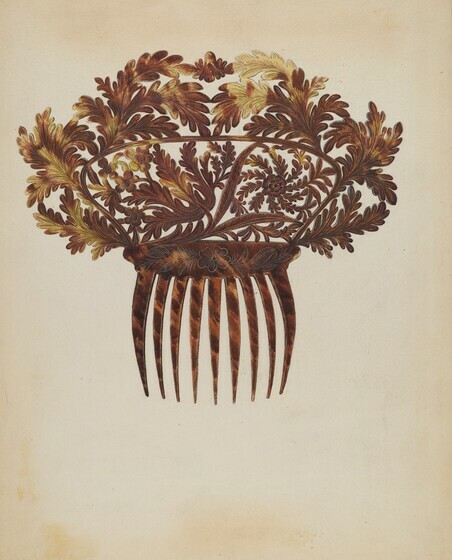 By the nineteenth century, great varieties of ornamental combs were available. This tortoiseshell comb, made between 1825 and 1830, is both carved and etched; the etching is identical on both sides. The comb is 9 3/4 inches wide, and its height at the center is 9 inches. Its size and elaborate open carving give it a striking effect. This is called a "Poke" bonnet. The word "poke" refers to the fact that there is room at the back for the hair to be poked up inside the bonnet so that the hairdo was completely covered. Dated from the 1840s, the bonnet is Victorian in style. The Victorian Age corresponds to the reign of England's Queen Victoria. Victorianism, in general, fostered certain attitudes about respectability, particularly with regard to the behavior of women. 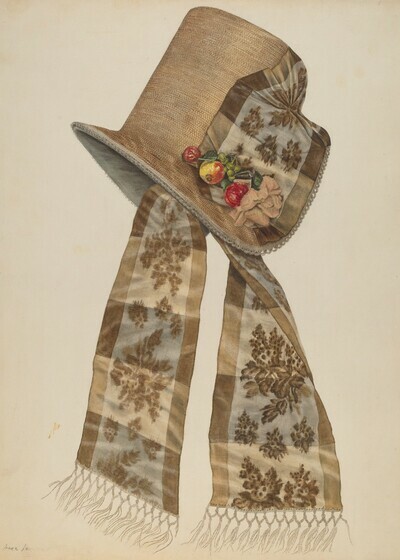 This bonnet, fitting down over the sides of the face, was intended to shield the wearer from the gaze of strangers. 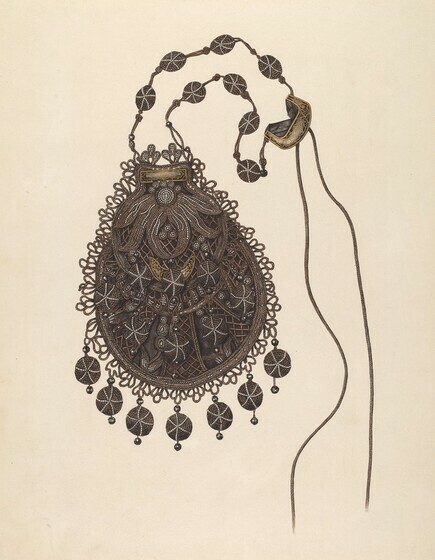 This handbag was made about 1850 in New Orleans. It is crocheted in black cotton, beaded, and has cut steel and jet ball trimmings. The design and decorative detail reflect a general taste in costume and the decorative arts at this time, which was more exuberant and less constrained than taste of the previous decade. Parasols -- used for protection against the sun -- became stylish in Europe in the middle of the eighteenth century. In 1772, a Baltimore merchant's chance purchase from a ship's store introduced the parasol to America. Soon the fashion centers of Philadelphia and New York took an interset in this kind of accessory. By the nineteenth century, parasols were commonly used by women for carriage rides or for promenading. 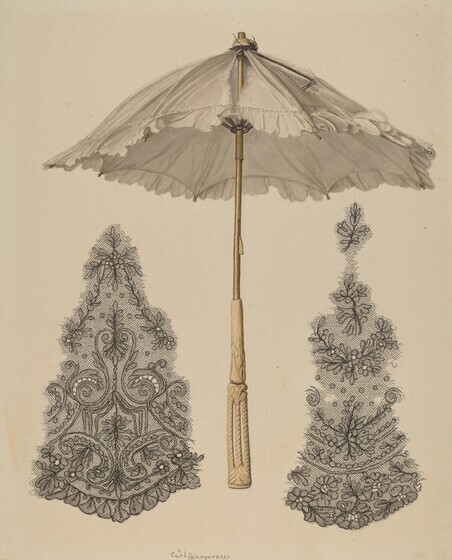 This silk parasol has an ivory handle and has black lace applied to sections of the covering. 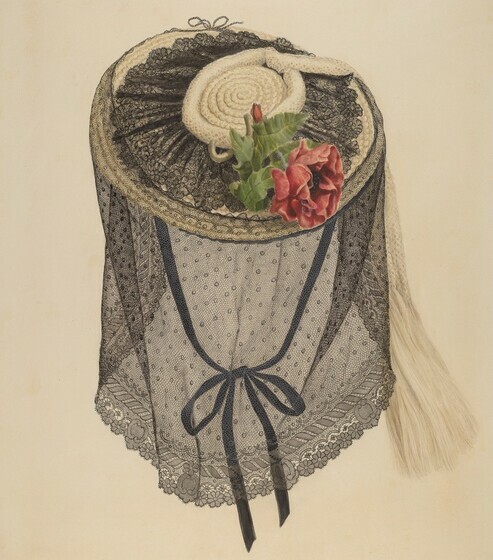 The style of lace indicates that the parasol is from the mid-nineteenth century. The folding fan was probably invented in Japan in the seventh century. Examples of fans from the East were brought into Europe during the Crusades. Folding fans were common as costume accessories by the eighteenth century and were introduced to America as early as 1732. During the colonial period, Boston was a fan-making center. This fan from about 1860 is constructed of black wood supports decorated with red and gold flowers. The upper portion is a colored engraving of fashionable young women and men amusing themselves in the countryside. 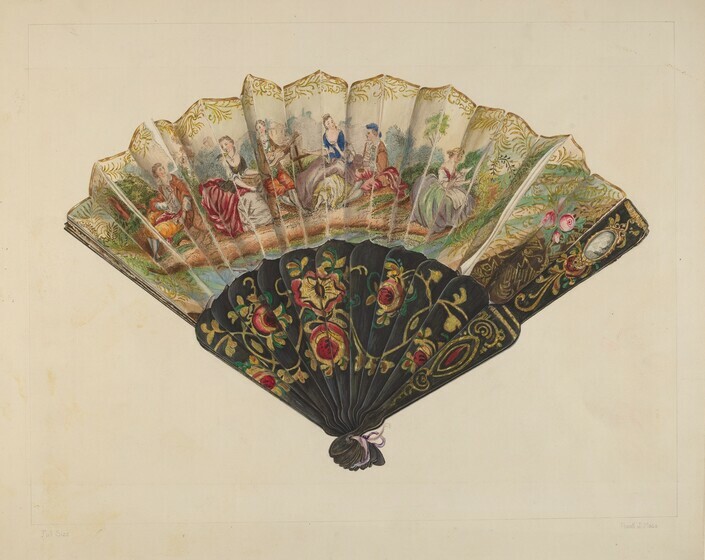 In addition to the beauty of this accessory, the way a fan was used indicated something of a woman's social grace. The English writer Joseph Addison, in his work The Spectator, compared a lady's skill with a fan to a man's use of a sword. Men's clothing of the mid-nineteenth century has the simplicity of style to which we are accustomed today. 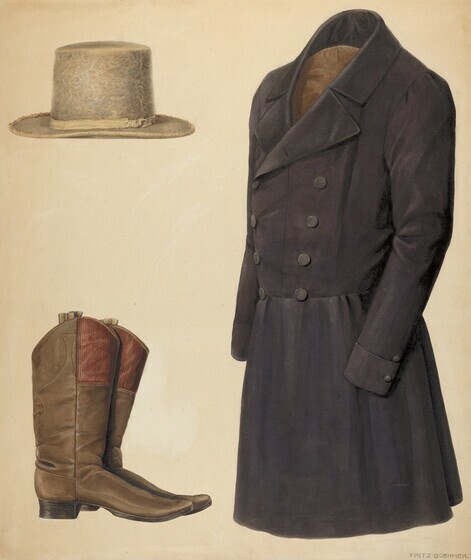 This coat and hat, dated about 1840, were made for Joseph Bimmler, founder of the Zoar Society, a religious community in Ohio. The coat of darkblue broadcloth was made in the community sewing house. The hat, called a "Beaver" or tall hat, has a label inside indicating that it was made by E. Brown in Philadelphia. The boots, dated about 1870, are from the Zoar Society's boot shop. During the second half of the nineteenth century, boots and shoes were made on wooden forms called "lasts," which were shaped for the left and right feet. Such forms are used for making shoes today. This boy's two-piece suit, dated 1850-1860, reflects a taste for elegance probably inspired by admiration of British and European portraits of young aristocrats. Designed for little boys under the age of ten, this type of suit came to be known later as "Little Lord Fauntleroy." The name was taken from a popular story published in 1866 by Frances Hodgson Burnett and illustrated by Reginald Birch. To complete the outfit, a child would wear white silk stockings and buckled shoes. 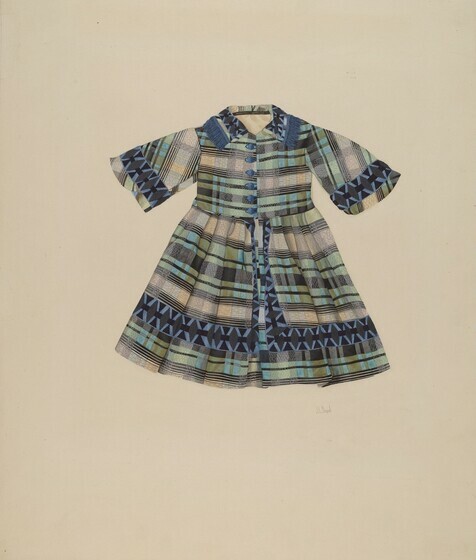 This child's dress was made about 1860 in New Orleans. The fabric is blue and green plaid linen. It has velvet ribbon trimming and silk fringe. The lining is unbleached cotton. Girls' clothing was patterned after adult styles. In most cases the length of the skirt was an indication of a girl's age; the shorter the skirt the younger the wearer. 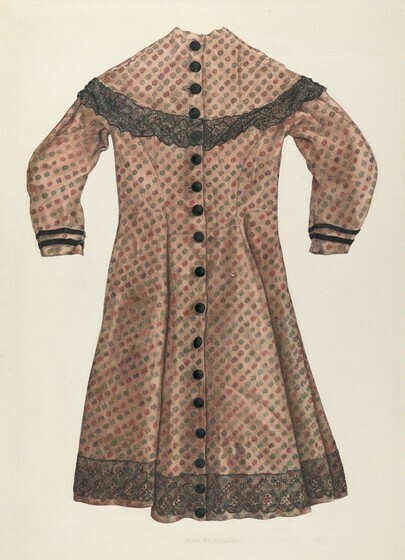 Intended for a seven-year-old girl, this coat resembles adult women's fashions of the 1860s. Many of these fashions were inspired by theatrical costumes, as is suggested here by the style of the cape. The coat is made of dove-gray cashmere wool, trimmed with red velvet ribbon. The coat is fastened down the front with hooks and eyes, and the red satin buttons are tacked on for decoration. The coat's lining is hand-quilted, white China silk. Women's fashions changed somewhat about the time of the Civil War. Most noticeable is the transition in the shape of the skirt from the full circular style to one in which the fullness is at the back. 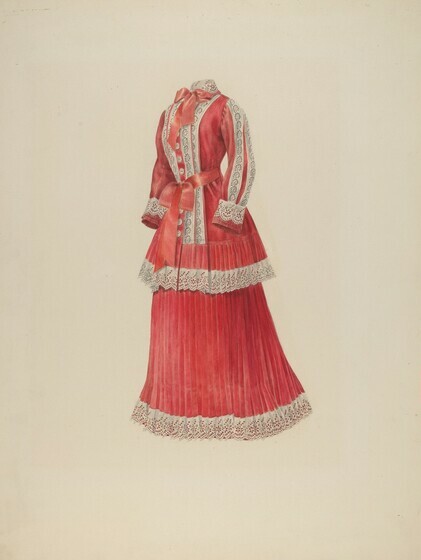 This two-piece, red silk "afternoon" dress has a cage-type skirt hoop to emphasize the fullness behind and includes a train at the floor to carry out the effect. Double sleeves were popular in the 1850s and 1860s; the idea was adapted from men's fashions where the shirt cuffs protruded beyond the sleeves of the jacket. Here the undersleeve, or "engageant," is of lace. 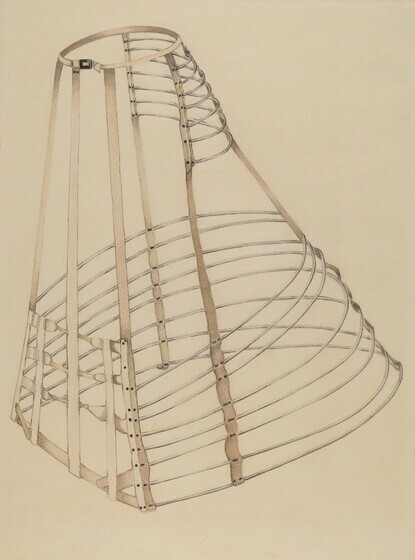 This is an example of a cage-hoop used underneath a skirt to provide fullness at the back of a woman's dress. Dated about 1865, it is made of half circles of reeds or whalebone riveted to bands of heavy linen tape. It is fastened at the waist with a steel buckle. An important effect of the hoop was the graceful, swinging motion it gave to a woman's skirt as she walked. The style of women's hats is another fashion that changed about the time of the Civil War. The earlier bonnet that covered the hair and shielded the face gave way to small, elaborately trimmed hats with veils. This straw hat with a black veil is dated about 1865. The bowed ribbon, seen behind the veil, was tied under the woman's chin to hold the hat in place. A knitted hemp scarf with fringed ends is wound around the center crown and falls over the rim at the back. By the 1870s, women's dresses gained fullness in back by use of a padded bustle. 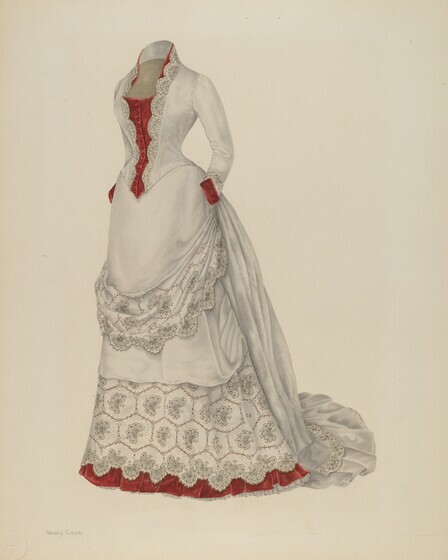 This two-piece dress, made of red cotton with white eyelet embroidery, has a bustle in back. The lines of the dress, however, are softer and fall closer to the body than those of fashions in the previous decade, indicating a movement toward a more natural form for women's clothing. This "visiting dress," dated 1883, is made of wool. It is constructed of multiple pieces. The waist has eight fitted parts, six in back and two in front. The overskirt is draped from the bustle at the back where it falls in a train. The vest, cuffs, and ruffle around the bottom of the skirt are of red velvet. 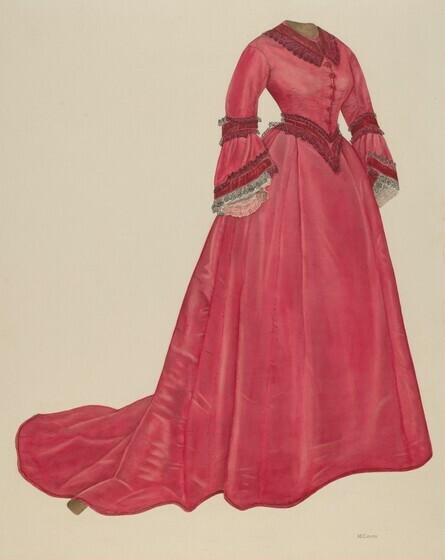 Complicated designs were common for dresses in the mid-1880s. The introduction and development of the sewing machine made construction of dresses with intricate patterns possible. While the bustle continued to be fashionable into the 1890s, a new style, called the "hourglass look," began to emerge. In this dress, dated about 1893, the hourglass effect of a narrow waist was achieved by padding the hips and widening the shoulders. The balloon sleeves and ruffles seen here are silk. The decorative band at the bottom of the skirt is embroidered black velvet. The designs of Charles Frederick Worth in Paris were enormously influential at this time, owing to fashion magazines such as Harper's Bazaar, Godey's Lady's Book, and Peterson's. These publications brought fashion news from home and abroad to communities throughout the country. During the 1890s, women participated in sports to a greater extent than earlier in the century. Bicycling had gained in popularity and helped make pants or "bloomers" acceptable for women's costumes. The word "bloomers" is taken from the name of Mrs. Amelia Bloomer of New York, who was an early advocate of women's rights. This "gymnasium suit," dated 1895, is made of black cashmere wool trimmed with bands of scarlet cashmere and black soutache -- a flat, narrow ornamental braid seen here at the borders of the scarlet trim. Plain, full bloomers, worn under the skirt, have elastic bands at the bottom. 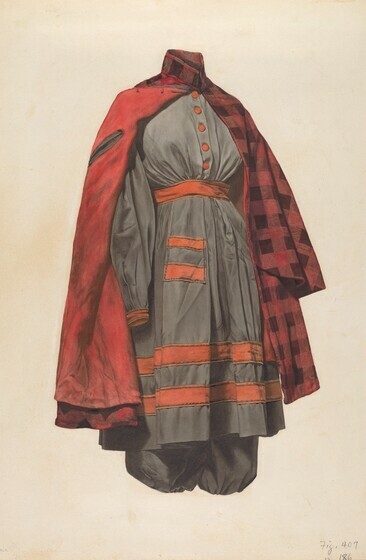 The costume includes a red and black plaid double cape. Sports costumes symbolized a new freedom and sense of change that was in the air at the end of the nineteenth century.